Wow! what a tasty trip to Ridgefield Connecticut. Home of, among other great things, Bailey’s Backyard an American farm-to-table restaurant. The place has a really warm and cozy atmosphere and the entire is just terrific. Oh, and Bailey’s has an Awesome chef by the name of Zach Campion. So let’s get to the food. I kicked things off with the crab bisque with crispy polenta, and diced tomato. Thanks Kyle for explaining the menu so well!! Up next were these amazing Brussels with smoked paprika and a cooling sauce! The third and final appetizer of the evening was George’s Bank Scallops, Pan seared scallops with crispy risotto, crispy pancetta, capers, roasted mushrooms, on a lemon beurre blanc sauce. Then it was time for the entrees and Chef Zach did not disappoint. He rolled out a rainbow trout, with fava & white beans, toasted almonds, wilted watercress, and brown butter! The fish was followed up by a dish of Lamb with buttermilk roasted cauliflower purée, blistered tomatoes, tempura eggplant, and chimichurri. Chef Zach really outdid himself with the final entree, a 72 hour sous vide Korean short ribs, roasted white grapes, green almonds, braised collards, sun-dried tomato couscous, and a blue cheese foam. A truly great meal was topped off by great dessert. I admit that I was a little worried about trying the Seared Vegan carrot cake with caramelized pineapple compote, carrot crumble, and a coconut sorbet but well…check out the video. The trip to Bailey’s Backyard was truly a fine dining experience for this kid foodie! I highly recommend that you stop by if you’re in Ridgefield. You won’t be disappointed. Many thanks to Mr. Salvatore for inviting me, Kyle for taking such great care of us, and of course a huge thank you to Chef Zach Campion for such a fantastic array of beautifully cooked food. On my way to a restaurant review I discovered a not-so hidden gem in Ridgefield. The Cake Box is delicious little gourmet cake and cupcake bakery. They do great cakes for all occasions, Birthday cakes…wedding cakes…baby shower cakes…bridal shower cakes…groom’s cakes…engagement cakes…sweet 16 cake. You name it, The Cake box can do it. But let’s face it, I’m a kid, and for kids like me the only thing better than cake is…CUPCAKES! The Cake Box has lots of cupcakes in tempting flavors like the Raspberry Lemon, its vanilla. cake filled with raspberry preserves and frosted with lemon zested cream cheese frosting. or the Mochaccino, which is Chocolate cake with espresso buttercream and semi sweet ganache. I decided to try the Fruity Pebbles Cupcake. An all vanilla cupcake with fun cereal topping. Check out my review in the video below. If you are in Ridgefield and you have a sweet tooth, or you need a cake or cupcakes for a special occasion, You can go wrong with the Cake Box! Thanks ladies, I’ll see you again soon. I stopped by 1 Twenty Two in beautiful New Milford Connecticut. Angela and Jermaine took great care of me. The restaurant has a cozy, family-friendly atmosphere and there is lots of great seating available. But let’s get to the food! One appetizer I tried was mozzarella en carozza topped with a house made marinara sauce AND a house made Alfredo sauce. I tried “when pigs fly” appetizer at 1 Twenty Two. It’s petite pork shanks with a sweet Thai chili sauce. Did I like it? Tagliatelli Bolognese #pasta at 1 Twenty Two -soooo yummy. Loved the sauce/noodle/meat ratio lol. And fried basil is yummy FYI. 1 Twenty Two has house made dough, house made sauce and a brick oven which equals thin crust amazingness! Margherita pizza anyone? One of their best sellers is their lemon chicken Romano with mozzarella, lemon sauce and served with garlic smashed potatoes and broccoli!! Apple cake and brownie sundae- both treats are family made!!! -ps my drink is steamed hot chocolate -no coffee for me! I really enjoyed my visit to 1 Twenty Two and so will you! I highly recommend that you stop by when you get the chance. Thank you so much Angela, Jermaine, Nina, and the whole team. I can’t wait to see you again. I had an amazing #foodie day at the First Annual New Milford New Food Truck Festival! Fork in the Road served up some “loaded Tots” that I tried. Tater tots stuffed with pulled pork, BACON!! and cheese. 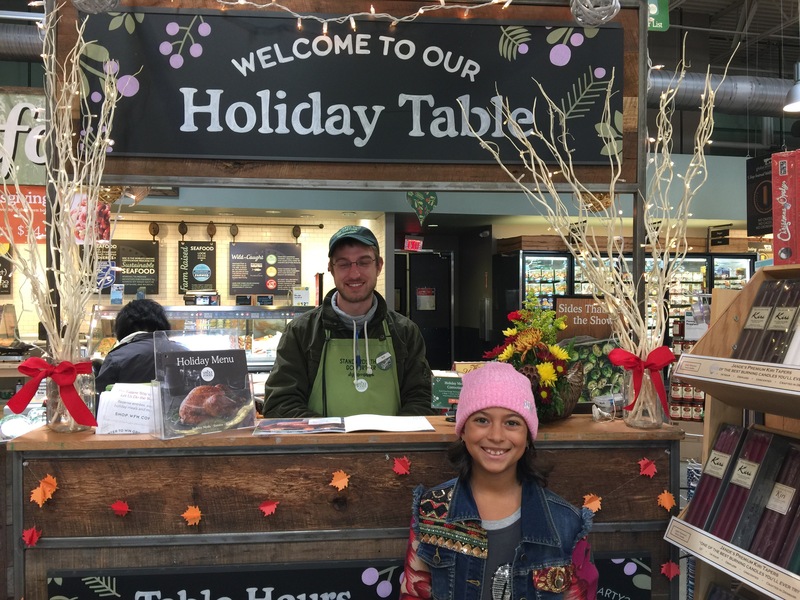 I stopped in to see what my friends at Whole Foods Market are serving up on their #HolidayTable this year. All I can say is, I’m definitely going to make this one part of #MyHolidayTradish. Here’s a tip for all you parents. A great way to make sure your kids don’t get Hangry during your shopping trip to Whole Foods. Take a look. I’ll be back soon with my next review. Don’t forget to follow me on all the usual places, FaceBook, Twitter, YouTube & Instagram. 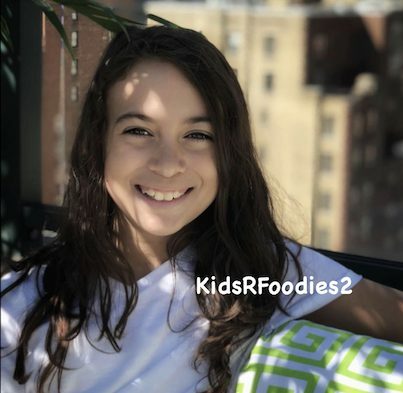 I was recently invited to take part in a super secret foodie event! I didn’t know the location and I had no idea what I’d be eating. All I knew was that it was in New York City and that food bloggers from across the country would be there. So cool! Once mom and I got to the city we were given more instructions and the secret location was revealed. My fellow foodies taking pics of all the yummy goodness. The whole #foodiechats gang & The Big Chicken. #FoodieChats founder, Steve Green hard at work. Of course there were lots of photo ops. It was a media event after all. Sadie Rae & Boston Market CEO George Michel aka The Big Chicken. Here is my review of the new Boston Market #OvenCrispChicken wrap. Take a look. This s is the official Boston Market video. See if you can spot the foodie. LOL! Super special thanks to Steve Green and the whole crew @Foodiechats you guys ROCK! Also thank you so much to @BostonMarket NYC. You guys are the best!